Deep groove ball bearings imported bearings are mainly used for pure radial load, but also to support radial load and axial load. When the only pure radial load, the contact angle is zero. When the deep groove ball bearings with a larger radial clearance, the performance with angular contact bearings can bear large axial load. Deep groove ball bearing friction coefficient is small, limit speed is also high, especially in very high speed axial loading conditions, deep groove ball bearings Thrust ball bearings are more advantages. Deep groove ball bearings are the most representative of rolling bearings, widely used. 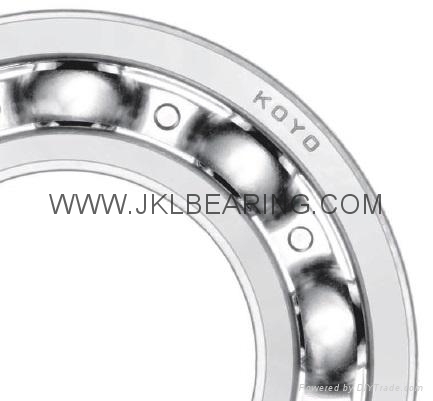 Deep groove ball bearings in the structure of each ring has a cross-section of the equatorial circumference of the ball one-third of the continuous groove type raceway. Deep groove ball bearings are mainly used to bear radial load, but also bear certain axial load. When the bearing radial clearance increases, with the nature of angular contact ball bearings, can withstand both directions alternating axial load. With the same size compared to other types of bearings, such bearings friction, high limiting speed, high precision, user selection is the preferred bearing type. Deep groove ball bearing structure is simple, easy to use, is the largest production volume, most widely used of a class of bearings. For high speed or high speed operation, and very durable, without regular maintenance. This kind of bearing friction, high limiting speed, simple structure, low cost, easy to achieve high manufacturing precision. Size range and diverse, used in precision instruments, low noise motors, automobiles, motorcycles and general machinery industries, the machinery industry, the most widely used class of bearings. Main radial load, but also can withstand a certain amount of axial load deep groove ball bearings can be used for transmission, instrumentation, electrical, household appliances, internal combustion engines, transport vehicles, agricultural machinery, construction machinery, engineering machinery, etc.